Rebelscum.com: Hasbro: New Forces of Destiny SDCC Exclusive Revealed! Hasbro: New Forces of Destiny SDCC Exclusive Revealed! Han Solo's Wookiee best friend Chewbacca and those adorable avian creatures called porgs were one of the best parts of the movie Star Wars: The Last Jedi, but they also returned in animated form in Disney's online webseries Forces of Destiny. And now Hasbro has some special collectibles based on their animated appearance. Here's an exclusive look at the premium Star Wars Forces of Destiny set -- which will be available only at this year's San Diego Comic-Con International (SDCC). The new Star Wars set includes stylized Millennium Falcon packaging to re-create the scene where several porgs join the heroes aboard the starship to leave the planet Ahch-To. The collectible set features an electronic Chewbacca figure that makes sounds when activated. It also includes action figures of two adult porgs, and a porglet nest with two baby porgs (that's four porgs total). Fans will be able to purchase this Star Wars pack for $49.99 at the Hasbro Toy Shop booth at SDCC. 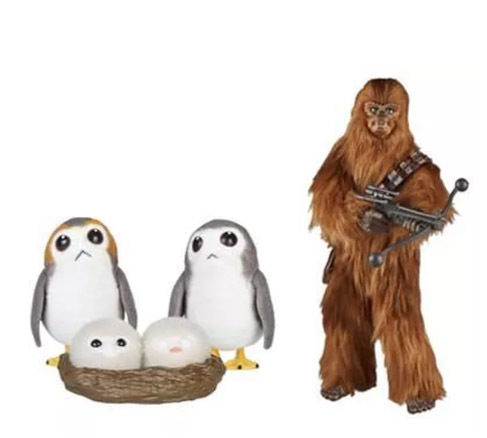 If you want to get this Star Wars Forces of Destiny set of Chewbacca and a porg family, get ready to stand in a long line at San Diego Comic-Con International. July 9, 2018 Hasbro: SDCC Exclusive Forces of Destiny Chewbacca and Porgs Photos!